Last Friday my wife and I went to see the Seattle Rock Orchestra and their tribute to David Bowie at The Moore Theater. The format was rather interesting, with local indie-rockers The Kindness Kind opened with the orchestra backing them up on a set of their melodic bjork-esque songs before a short intermission before the main event that every was there to hear, the David Bowie covers. 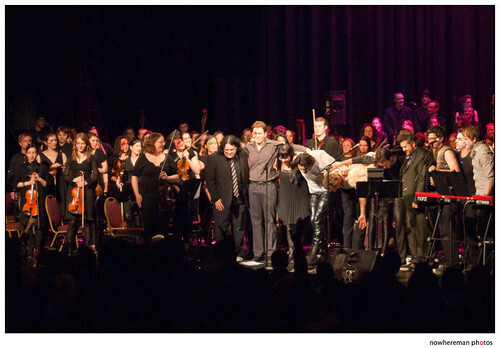 The Kindness Kind accompanied the orchestra, and a bevy of local singers came out to do their own renditions of Bowie tunes, for the most part two from each singer. First up was Tom Beecham of The Raggedy Anns, who really looked the part, and did a fantastic job, though I confess I’m not enough of a Bowie nerd to know which songs he sang. After that Alessandra Rose of The Kindness Kind came back up to sing an incredible cover of Oh! You Pretty Things. I didn’t recognize the other tune she did. Then came Tim Keller of Discs of Fury who, despite a broken foot, did a fantastic job on Boys Keep Swinging, and even whipped off his shirt to catcalls from the crowd. He only did the one song, but I won’t hold that against him. Next up was David Terry of Aqueduct who did two songs that I actually recognized. He did Changes and Man Who Sold The World and danced along gleefully in his formal suit and hat and cheesy sunglasses. Next up was Jon Auer of The Posies who brought his acoustic guitar up on stage and played 2 songs including an awesome version of Starman. Lastly was Nouela Johnston of People Eating People. Though I didn’t recognize either of her songs her vocals were simply incredible. She has an incredible soul voice that just rips out of her. Definitely check her out! For an encore Jon Auer came out and sang another tune, and then Alessandra Rose ended the night with Life On Mars. A beautiful way to end the show! We had a blast. We had only two complaints. The sound where we were sitting (about halfway up on the floor level) just didn’t have the oomph it really should have, but that was pretty minor. The main complaint is it just wasn’t long enough. Sure it lasted for a good couple of hours, but it was just so good and so fun that it should have lasted till about 2am. Next time, guys… next time!